Enter a futuristic city built on the site of Denver Airport. In a vastly underpopulated world, nations have been replaced by densely populated city-states. Immense walls protect the citizens from undesirables outside as well as protecting the outside environment from the citizens inside. 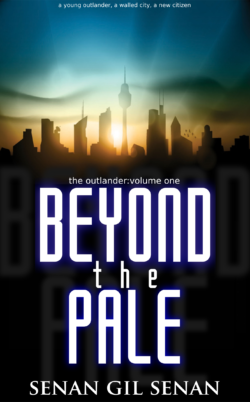 An outlander is taken in by the family of a security officer whose life he had saved. Through his daily interactions with those he meets and by falling in love with his benefactor’s daughter, we get a vision of life inside. Here citizens have traded liberty and self-determination for control and security. The hardships experienced living as an outlander are juxtaposed against the luxuries and comfortable lifestyle within. His family and the many others from his community are looking for him. Whether he returns is a question of will rather than way. An odyssey of experiences and emotions.